Take the Airport Express Bus bound for Tsukuba Center/Tsuchiura Station. Get off at Tsukuba Center. It takes about 80 minutes and costs 2,600 yen. Bus tickets are available at the Keisei Bus Counter which is located on the same floor as you exit from the immigration. Take the Airport Express Bus bound for Tsukuba Center. Get off at Tsukuba Center. It takes about 2 hours and costs 1,850 yen. Bus tickets are available at the Bus Ticket Sales Counter located on the 2nd floor, Arrival Lobby. Take Kanto Tetsudo Bus bound for Tsukuba Center. It takes about 1 hour and costs 1,030 yen. Take JR or Kanto Tetsudo Highway Bus bound for Tsukuba Center. The bus stop is outside the Yaesu South Exit. It takes about 1.5 hours and costs 1,180 yen. 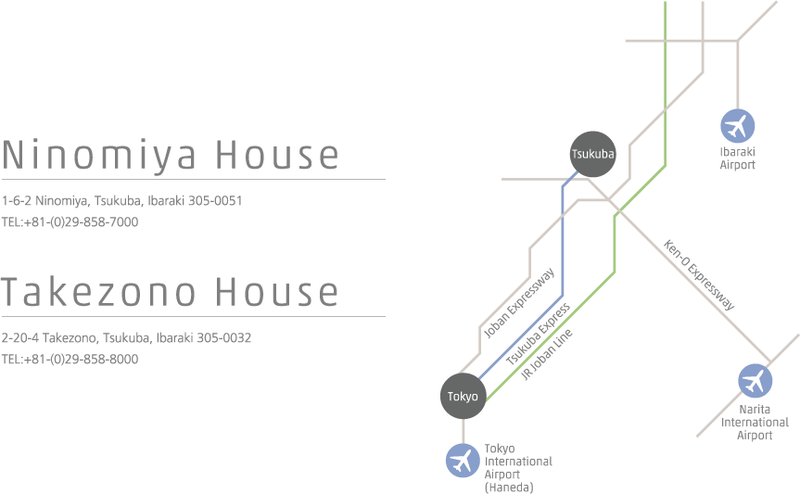 Take Tsukuba Express (TX) from Akihabara Station and get off at Tsukuba Station. It takes 45 minutes by Rapid, 52 minutes by Semi-Rapid and costs 1,190 yen. By BusTake a bus bound for "Hitachino-Ushiku Station" (No. 30 or No. 31) at Tsukuba Center Bus Terminal. It takes about 5 minutes and costs 170 yen. Walk to Ninomiya House for a few minutes. Exit from Tsukuba-Ushiku I.C., take Nishi Odori Street towards Tsukuba Science City. Turn right at the traffic light (about 7km from the I.C.) where a swimming school is on your left. Turn left at the 1st corner, and it is on your right hand side after two blocks. Turn right at Minami Odori Nishi Crossing and take Minami Odori Street. Turn left at the 1st traffic light (EPOCHAL TSUKUBA Iriguchi), and it is on your right hand side, next to Tsukuba International Congress Center. Exit from Sakura-Tsuchiura I.C. and proceed to Tsukuba. Turn right at the 2nd traffic light (Sasagi) and take Higashi Odori Street. Turn left at the 7th traffic light (Minami Odori Higashi) and take Minami Odori Street. Turn left at the 2nd traffic light (EPOCHAL TSUKUBA Iriguchi), and turn right at the 2nd corner. It's at the end of the street. Turn right at the 2nd traffic light (EPOCHAL TSUKUBA Iriguchi). It is on your right hand side, next to Tsukuba International Congress Center.